Consumers can use social media to rate a restaurant’s food, ambiance or speed of service. Now a new app will allow diners to rate the noise levels at their favorite eatery. The iHEARu app officially launched on Tuesday in San Francisco, the first city in what promoters hope will become a global network to help consumers find “ear-friendly” public places. With the free app, users can measure decibel levels at all kinds of establishments. But restaurants will likely be a key target as a growing number of consumers seek out dining spots where they can carry on a conversation over a meal, said Kelly Tremblay, founder and CEO of Lend An Ear, a Seattle-based organization behind the iHEARu app. Growing noise levels in restaurants is a problem that is increasingly called out by reviewers, “but the question is, why isn’t anyone solving or addressing it?” said Tremblay, an audiologist, neuroscientist and an advocate for the hearing impaired. Tremblay cites a 2015 survey by Zagat that found the noise levels in restaurants listed as the top complaint by diners. More than 20-percent of the U.S. population has some hearing loss, and one in three people over age 65 have disabling hearing loss, she noted. But noise levels are also a concern for any guest looking to have a quiet business meeting, for example, or for a group looking to hear each other speak. The app is not designed to punish loud restaurants, but to give consumers crowd-sourced information about the most “ear-friendly” venues or best timing for finding a quiet spot. Users can open the app in any restaurant and map it, then press a button to make a recording to determine sound levels. Users can also add comments about their own subjective experience and share it through Facebook or social media. Eventually, as more data is collected, the app could also be used to search for ear-friendly restaurants or to determine the best time of day for a quieter visit. Someone looking for a brunch spot, for example, could see how noise levels compare at 11:30 a.m. at a rated venue, compared with noon or later, Tremblay said. In addition, restaurants can be certified as ear friendly based on commitment to certain practices, such as being willing to turn down music on request, having rooms or tables in quieter areas, using acoustical tiles or other sound-absorbing materials, sound isolation, table placements or other noise-reducing practices and, of course, being rated well by the app. Melody Stein, owner of Mozzeria in San Francisco, points to the "ear-friendly certification" placard in the front window. The San Francisco pizza restaurant Mozzeria is the first restaurant to become certified ear-friendly, allowing owners Melody and Russ Stein to post a placard in the restaurant’s front window stating that fact. Mozzeria became certified in part because the restaurant is quieter by nature. The restaurant’s entire staff is deaf, though the vast majority of guests are not. 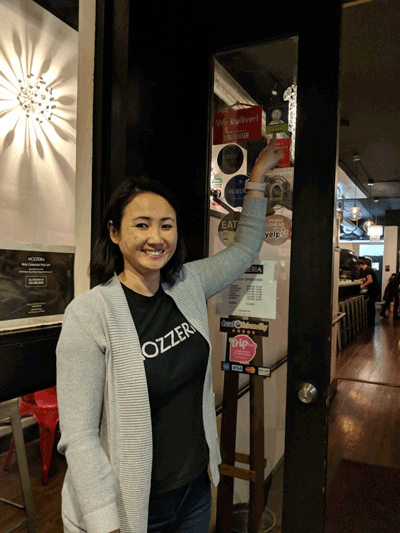 Music is played in the venue, but at a low volume, and people often say it’s conducive to business meetings, said Tiffany Ruffa, Mozzeria’s senior team leader. The day after the launch, the app had been downloaded by about 70 people willing to become “hear-oes,” as they are called, to begin collecting sound measurements. Tremblay hopes to see that number grow as word gets out and the app moves to more cities. A launch is planned in New York in April, she said, and the group plans to add Portland, Ore., Seattle, Washington, D.C., and possibly Atlanta and Chicago this year. Down the road, Tremblay said she hopes to work with travel sites to identify ear-friendly venues outside the U.S.